Just ordered a pair. Dang, I need more knight-type figures now! im hving all sorts of problems accessing that google checkout. i created a google account, put in my credit card info, created it, ad when time came to order, i got an error. was it processed? who knows. Poe, is there another way of sending you the funds? with the second run are you planning to include more colors..coz i am looking at atleast 4/5 more of these swords.. I don't see anything available in the store. 🙁 Sold out? I apologize, I didn't see your post until just now. I don't see an order under your name. The other way to pay is using PayPal–can you use that? I'm sold out of swords now, but I'll have more soon (hopefully within a week or two). @bmnbinc: There won't be any other colors in my own second run, but SMC plans to offer alternate colors eventually. 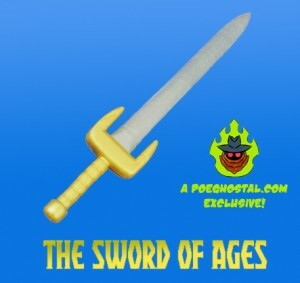 The golden hilt is the PGPoA exclusive. @Poe : hmmmm..then will have to wait for SMC releases..
have you thought of anything else to put up for a christmas sale for all us loyal MOTUC fans? thanks Poe. i finally made a new account, and end result was google checkout wouldnt send out to APO address. so they shafted me.